Welcome to Winter Wizard Jam! Use this subforum to write dev logs, recruit team members, and chat about #wizardjam. Reminder: If you submit a game to the game jam page, the game jam page is really just a pointer to your game's page, so revisions you upload after the jam ends will still be pointed to from the jam page. If you miss the deadline, Dinosaursssss, Zerofiftyone, or myself are able to get your game listed on the page. Just let us know. Super Briefly: Time is precious. The rounds in your game are completed as quickly as possible. Seconds in, a player is eliminated. You blink, and a victor emerges. Another minute, and the game has brought you to tears. Focused Palette: Make a game using as few colours as possible. Tone Control: The audio in your game is reactive and directly manipulated by the player’s inputs and actions. Designer Notes: Include a director’s commentary in your game. “It’s a Baby Game”: Think back to your youth and create a game inspired from a childhood toy or activity. Bonus points if your game can be played by a baby. Hemispherist: Throw another shrimp on the barbie and make a game celebrating the Southern Hemisphere’s beautiful summers. Penguins in bikinis please! Dishonored Holidays: I don’t really know what this means but I think they generally happen a week before the regular holiday #HappyDishonoredHalloween ! Note: As with the first Wizard Jam, the theme and diversifiers are completely optional. Most importantly we want to get as much of the community involved as possible. If you have never made a game before now is a great time to start! I want to join a team! Head to the team building thread and follow instructions there. I want to contribute content to someone else’s game! Head to the team building thread and follow instructions there. I want to contribute my knowledge as a game making expert! Likely the best thing to do is frequent this forum and help people out as they post in their development threads. Additionally, hanging out in the Idle Thumbs Readers Slack may be a good way to provide more immediate help. Never made a game? No idea what engine to use? Check out Sortingh.at by Zoe Quinn for figuring out what tools to use. Pixel Prospector - Lots of good resources. Unreal, Twine, Construct2, Game Maker, and GameSalad all have scripting systems that doesn't require writing code. Playmaker ($95) is a visual scripting plugin for Unity that has been highly recommended to me. If you're interested in 3D, I also recommend getting the free 3-year student license for Maya. It's an industry standard tool, and only requires that you put in a bogus .edu email address. If you need art assets, you can also peep this thread. 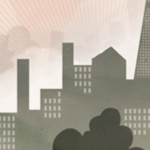 Thanks to Lu for making the artisanal banner image. And to whomever made the original Jam banner, since it's pretty much that with extra words! The original banner was by Coods! Last wiz jam I tried to work on my 3d art skills, I think this time around I'd like to pick up LÖVE or Corona and learn LUA finally, or finally actually dig into C++. What, if anything, is ok to work on in advance of the start date? Can I outline an idea? Work on dialog? Gather assets? Is is the spirit of The Jam to do all of that between the 28th and 13th? Any chance of moving all the old topics to a subforum so it's archived and this forum is clean? First off, this is all for fun so pretty much it doesn't matter how you do it. But, if spirit is what you're concerned with, my opinion is that it's definitely cool to start gathering your tools, writing some test code, and otherwise preparing more abstract resources. As for the specificity of your idea, it's hard not to start thinking of something already, so I feel the most spirited way to do that is have an idea, and when the diversifiers are announced, mutate your idea to conform to some of them. The bulk of your work should be done during the jam dates. Thanks for stickying the new threads. I love to skew comedic! Moved old games to new subforum. Let me know if you want any changes. So I don't know anything about winter holidays. They're cold and not particularly interesting except for when my birthday falls in them. Apparently it's supposed to rain deer? Oh silly, it is summer for you! Make a sunshine game. Or use everyone's favourite misunderstanding and make a game based on the song California Dreaming. Hey all, really excited to make games with you! This will be my 10th game jam (I think?) so I'm well versed in making video games quickly. Any first time game jammers feel free to hit me with any questions, especially those planning on using Unity. I am tentatively in, although this week coincides with a big business trip for my job, but I think I'll have a huge amount of potential free time to horse around with an idea I have. I had a lot of fun last time, even if my game was altogether real dumb. It was super exciting to have a reason (and a deadline) to focus creativity. More specifically, there's no need to have a date there since it'd just need to be updated repeatedly. 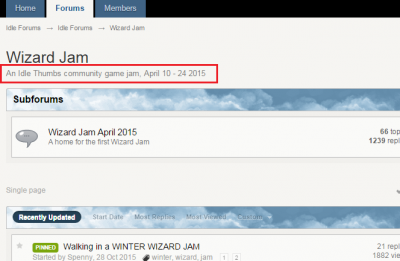 That's a link to the sub forum for all the April 2015 jam threads. Just a little over a week till this starts. Are those people looking for teams successful in their endeavors? Any more we can do to facilitate the process?